Liverpool salutes its 'little warrior': Mourners applaud and toss flowers at hearse carrying right-to-live toddler Alfie Evans' coffin as his heartbroken parents prepare to lay him to rest. Hundreds of mourners, some in tears, lined the streets of Liverpool today to salute little Alfie Evans, applauding and throwing flowers onto the toddler's hearse as his parents prepared to lay their son to rest. Supporters, some wearing Alfie's Army t-shirts, gathered outside Goodison Park, waiting to bid a final farewell to the 'boy who touched hearts around the world'. A black funeral hearse carrying his tiny white coffin, adorned with a blue heart and toy soldiers - a nod to Alfie's Army, made its way along the route after the private funeral service earlier this morning. Mourners broke out into applause as the hearse, carrying floral tributes spelling out 'our hero', 'warrior', 'son', 'grandson' and 'nephew' passed by. 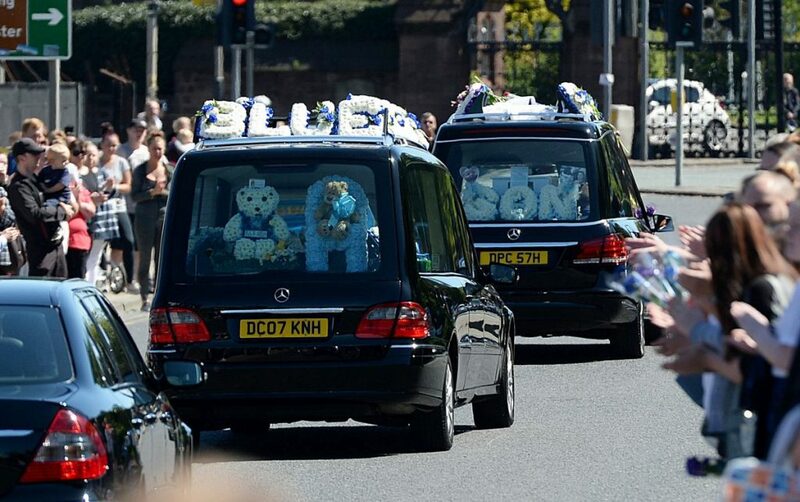 The toddler's private funeral was held in the city this morning but supporters were invited by his parents Tom Evans and Kate James to watch the procession as it passed Everton FC's, Goodison Park. Alfie's father Tom has said he always dreamed of taking his son to Goodison to watch his beloved Toffees. A hearse carrying the coffin of British toddler Alfie Evans drives past Everton's Goodison Park stadium in Liverpool as his bereft family lay him to rest on Monday. His parents, who had opposed Alder Hey's decision to withdraw life support from the 23-month-old who had a degenerative brain disease, have asked people to show their support for the procession but asked for privacy at the funeral itself. Alfie died shortly before his second birthday following a long-running legal battle. Mr. Evans and Ms. James had hoped to take Alfie, who had a degenerative brain disease, to a hospital in Rome. A purple and blue balloon were attached to the statue of the Everton striker Dixie Dean outside the stadium entrance, with a floral tribute and small collection of toys left beside it. Mothers Candice Cadette, 30, and Cherrelle Bright, 31, came over from Manchester to show their support. Mother-of-three Candice said: 'He was an amazing little boy with so much courage. We just all need to come together to support him and his family and show that they're not alone. Anne-Marie Guddery, 49, from Liverpool said: 'I wanted to come and show my respect to the family and the little boy. Pope Francis became personally involved in the case and urged the NHS to let the child travel to his children's hospital close to the Vatican. Merseyside Police sent a small number of officers to offer support for those attending but stressed it would not be open to the public. Chief Inspector Chris Gibson said: 'We respect that this is a very difficult time for Alfie's family, friends and the wider members of the public and appreciate that a number of people will want to pay their respects and offer their condolences. 'Alfie's mom and dad, Tom, and Kate, continue to thank the community for their support but have asked us to ask well-wishers to respect their privacy during the event. February 20: Mr. Justice Hayden rules that doctors can stop providing treatment to Alfie. March 6: Three Court of Appeal judges back High Court judge's ruling that doctors can stop treating Alfie. March 20: A panel of three justices, headed by Supreme Court president Lady Hale, decide that the case is not worth arguing and has refused to give the couple 'permission' to mount a further appeal. April 11: High Court judge endorses an end-of-life care plan for the 23-month-old boy. April 16: Parents mount a new legal challenge, asking that he be allowed to travel, but again lose at the Court of Appeal. Alfie's parents apologize after reports of intimidation and verbal abuse among hospital protesters. April 20: Supreme Court rejects latest legal bid for the youngster to travel. April 23: European Court of Human Rights refuses to intervene. The Italian Foreign Ministry grants Alfie citizenship amid protests outside the Liverpool hospital. God bless the sweet little one and his family for fighting and enduring the preciousness of life. More FAKE NEWS from the FAILING New York Times. Excellent article about a heart breaking death. RIP sweet Alfie, and I will continue to pray for comfort for his parents. Alfie's story from the beginning sickens me. I'm not so sure he even had the correct diagnosis. In a free society one is allowed to get a second opinion or as many options as you want. But, with socialism, you don't have control over your own destiny. This may seem harsh, but my opinion is they murdered that baby. It would have cost the hospital zero dollars to let him go to Italy. My heart is with the parents & I will continue to pray for them. This is the exact type of medicine the Democrats want in this country & we have to get to the polls & vote them out of office. God Bless Alfie. God help those who allowed this child to suffer & die. I've watched too many anti-vaccine videos I suppose. Therefore, I choose to stand with the least popular opinion. that this is a case of vaccine injury resulting in death. It's not like it hasn't happened before. Such a heartbreaking situation. He is now in paradise!